Gwen Raverat, wood engraver, book illustrator and author. The granddaughter of Charles Darwin, she trained at the Slade School of Art (1908-11). In 1911 she married the French painter Jacques Raverat, with whom she joined the Bloomsbury Group and Rupert Brooke’s Neo-Pagans. After moving to Vence, following Jacques’ death (1925) she returned to Cambridge, where she had spent her childhood. Raverat played a significant part in the wood engraving revival in Britain at the beginning of the twentieth century. 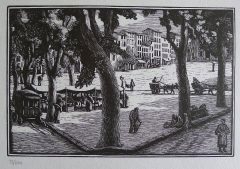 By 1914 she had completed some sixty wood engravings, far more than any of her contemporaries. Her name recurs consistently in all contemporary reviews, and the first book devoted to a modern wood engraver was Herbert Furst’s Gwendolen Raverat.. She illustrated the first book illustrated with modern wood engravings, Spring Morning, and she exhibited at every annual exhibition of the Society of Wood Engravers between 1920 and 1940, exhibiting 122 engravings, more than anyone else.